A compelling card at the ICE Arena Wales, Cardiff, which had seen Lee Haskin’s successfully defend his IBF Bantamweight title and the superb Andrew Selby win the British Flyweight title, finished with the Fight of the Night. 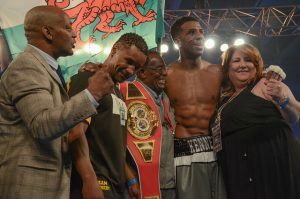 Popular Cardiff boxer Craig Kennedy took on the huge “Big Joe” Joel Tambwe Djeko, in a ten round contest for the vacant IBF International cruiserweight title. “The Kid” had a lot of support in the arena having shifted over 700 tickets. 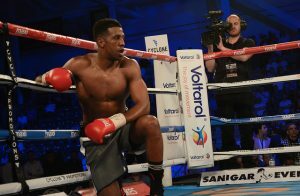 Joel Tambwe Djeko came to Wales as somewhat of an unknown quantity but the 6’6″ Belgian certainly proved on the night that he is a very dangerous boxer. It was Djeko that drew first blood, though due to a head clash, leaving Kennedy with a nasty cut in the first round. The cut was brought under control by Chris Sanigar, in the corner. The second round saw Craig dropped by the ropes from a huge right-hand. The Cardiff man sucked it up, rose, and soon regained composure. Djeko had set a marker and in a lot of the following rounds would start fast, but then the remainder of the rounds saw Kennedy use a stong jab and good movement to control the action. “Big Joe” was always a threat, as he was wild and unpredictable but always powerful. Kennedy boxed patiently in the third while a right-hand had the giant stumbling in the fourth. There was always a danger that the judges could favour the Belgian’s short, eye-catching bursts rather than the better technical work of the local boxer. Referee Howard Foster wrongly called a knockdown in the sixth, as Djeko pushed Kennedy over with an arm rather than a punch. As the fight wore on it was Kennedy who was the busier, as his opponent tired and slowed – though flamboyantly played/teased the crowd at times. The rounds were close and not straight forward to score but it was “The Kid” who was doing most of the scoring with the orthodox jab and straight shots. The two men were showing each other respect after each round, as they had both taken solid blows and were still competing for supremacy. 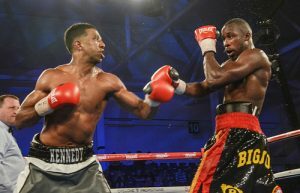 Kennedy’s superb conditioning allowed him to finish the last four rounds the fitter, as his opponent slowed down. The fight had been tense, dramatic and a thrill to watch. It captivated the crowd and the TV audience. The tension continued when the verdict was declared a split decision. British judge Phil Edwards scoring it 95-93 Djeko; Canadian Judge Alan Davis scored 95-93 to Kennedy; while American judge Alex Levin also saw it 95-93 to the Welsh boxer. Cuts, Knockdowns, big punches and boxing skills supported by a passionate Welsh crowd. The fight had a bit of everything and it was a well-deserved victory for Craig Kennedy. 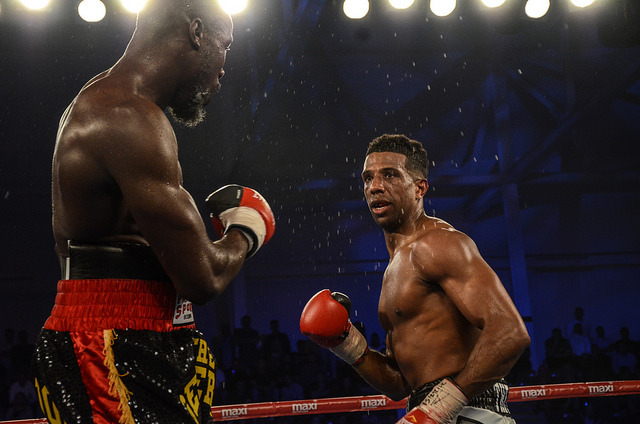 Craig Kennedy remains unbeaten at 15-0, 8 KOs while Joel Tambwe Djeko is now 9-2-1, 4 KOs.